I've been resisting these ever since they came out, but after walking past the display at Ulta one last time and feeling how soft and rich the shadows felt, I finally caved and ordered one. 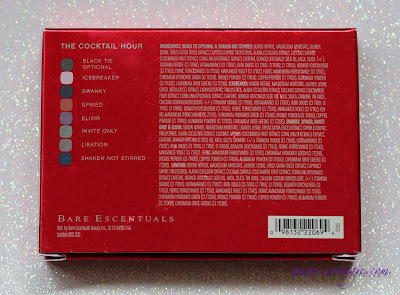 There are currently two bareMinerals READY Eyeshadow 8.0 palettes, a warm (The Playlist) and the one I have, The Cocktail Hour, which is cool toned. 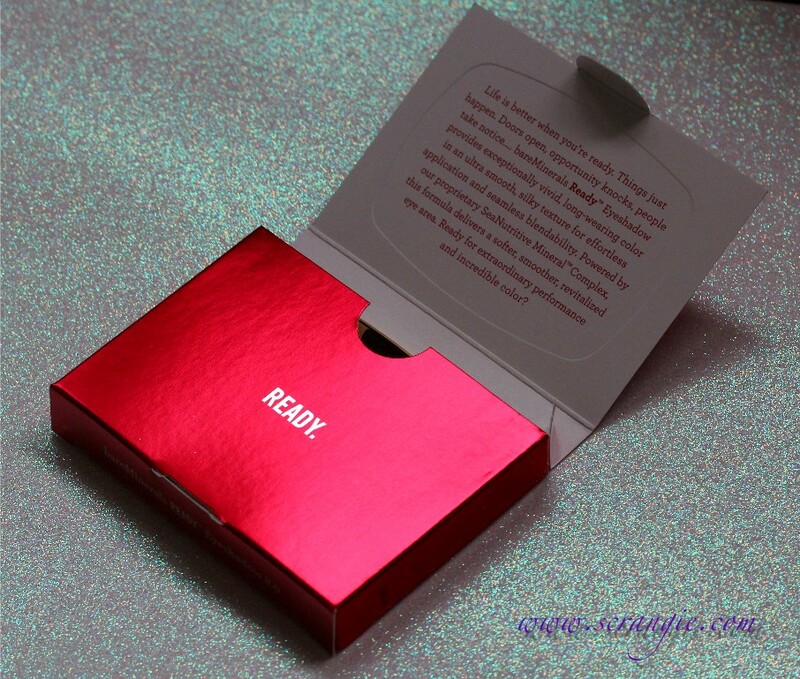 The palette comes in a shiny metallic red box with gold foil accents. It's quite striking. The front flap unfolds so you can remove the palette from its cardboard pocket. The back of the box has a full ingredient listing and has the names and colors of the shades in the palette. 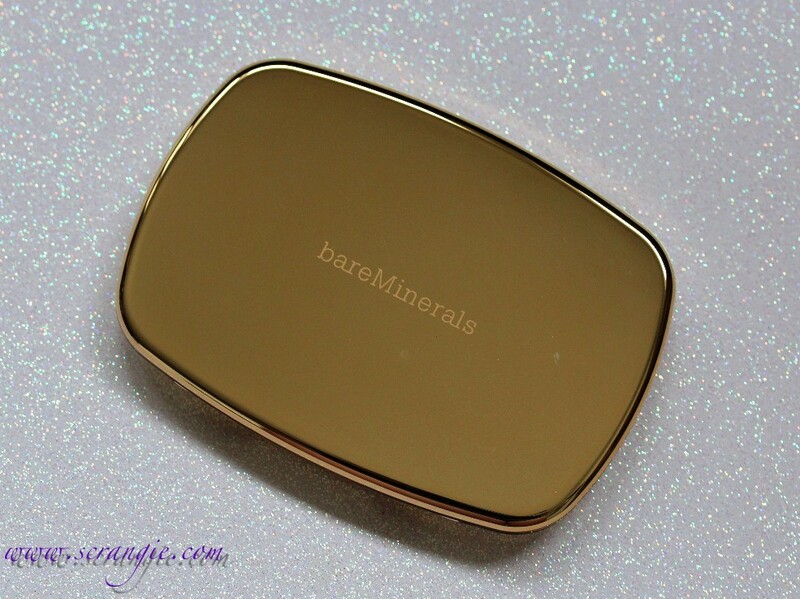 The palette itself is a shiny, mirrored gold. It hinges open to reveal a full-size mirror, a mini double-ended eyeshadow brush and eight penny-sized shadows. The shadows have an amazing texture. They're soft, smooth, creamy, silky, basically what every shadow should feel like. The payoff was great on almost every color. Some of the colors have a really fine microglitter type sparkle that actually sticks to the eye and looks really delicate and pretty. The little brush they included is actually useful- not too scratchy or limp. Much less messy and a lot more convenient than the little jars of loose shadow Bare Escentuals / Bare Minerals is known for. Better color payoff and easier blending than the loose shadows. The colors are pretty bland. They can look a little muddy and I don't feel like they all compliment each other. Most of the shades are super frosty. 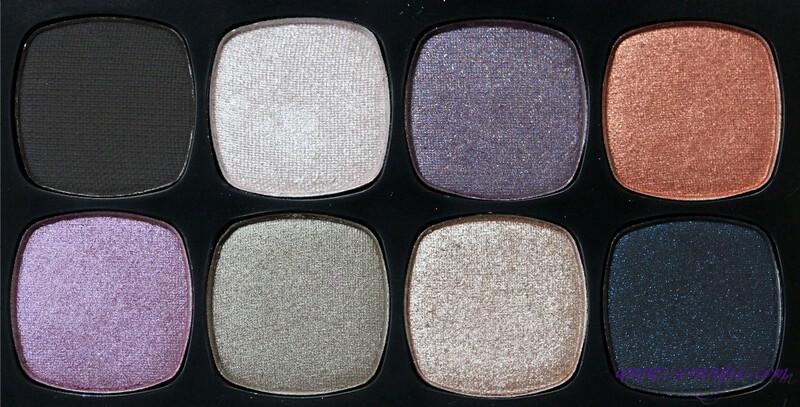 Most of the shades apply a different color than they look in the palette. The lavender shade fades really quickly. The mirror-like palette is a magnet for fingerprints and scratches. The sparkles in Shaken Not Stirred don't show up on the eye. $40 is a lot for this. 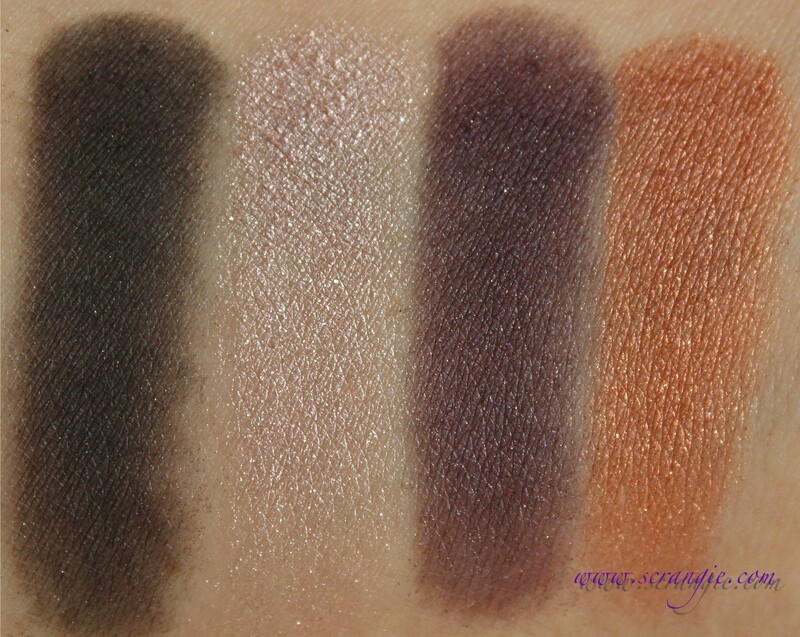 Yeah, the shadows feel amazing, but they're small (net weight of the palette is 8g / 0.28 oz). For comparison, the Urban Decay Naked Palette has a net weight of 14.4 g / 0.6 oz (twelve shadows), a mini primer and a full sized brush for only $48. Overall, the quality is there but I'm not wild about the colors. I should have gotten The Playlist, but I changed my mind at the last minute because I thought it would be too warm for me. 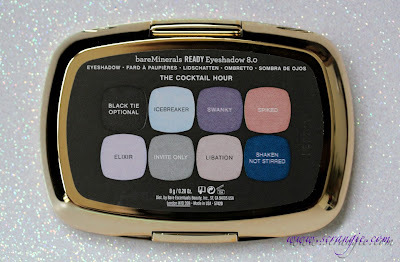 The shades in The Cocktail Hour are all really good as staple/everyday shades (especially the taupe), but I wish there was something in here that didn't look so muted/muddy, just to liven things up a bit. I'd definitely buy another READY palette if the colors were more interesting, the texture of the shadows is awesome. My only real complaints are that the colors are dull and that $40 is too much for such little product. 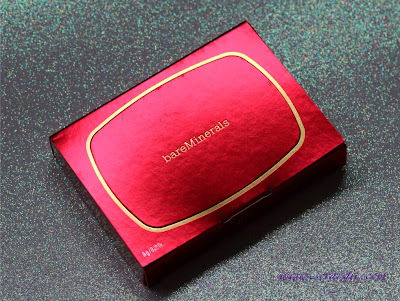 I got mine from beauty.com, but Bare Escentuals and Sephora also have the READY 8.0 palettes. They're both limited edition. I'm glad you commented on the size vs. the cost on this. I have one of the duos, but haven't gone for the palettes. I agree with you that if it had a few non-muted shades, it would be nicer. Great detailed review. 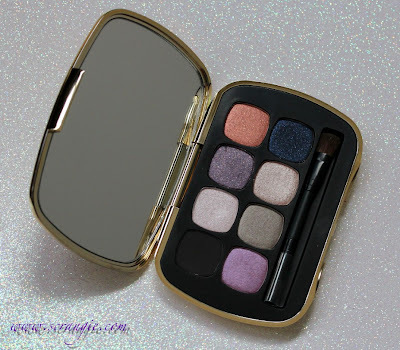 I think the colors look really pretty and wearable - but I agree that it sounds small and expensive for what it is. 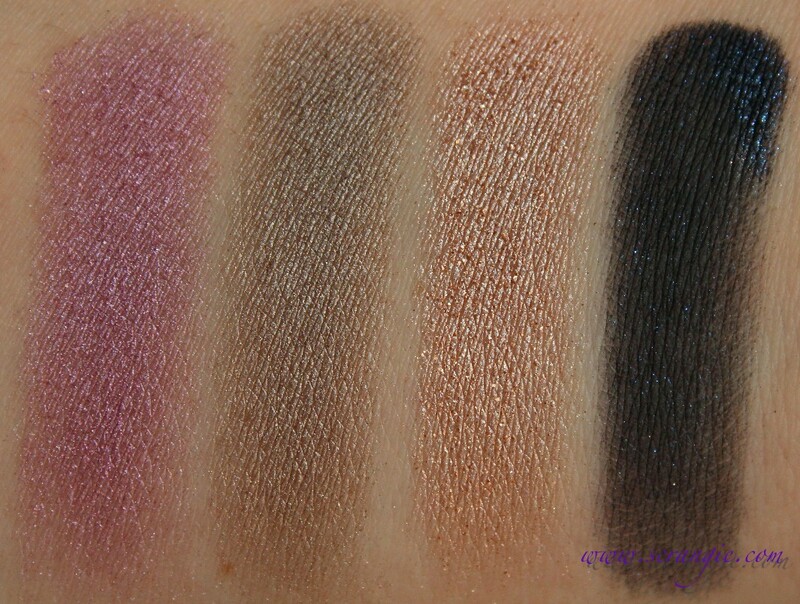 I have the 4.0 in The Dream Sequence (3 purples and 1 neutral) and I love it...so gorgeous. I wouldn't bother with "The Playlist" if you are looking for color diversity...the ones in that palette all turn different versions of brown once they are applied :/ I think these palettes are a great step in the right direction for BE...hopefully more interesting color combos will emerge! I got both palettes, but I really love the warm one. You definitely need it instead! I really like the texture of these shadows, but I haven't been overly-impressed with the colors offered! None really speak to me. I think if you didn't have much eye shadow already, these would be great basics, but for those of us with a long-standing makeup addiction (*raises hand*), there's nothing unique enough to justify a palette of dupes. Too bad, because I would love to try these out! Thanks for your thoughts and review! I agree with what you've said, Sarah. 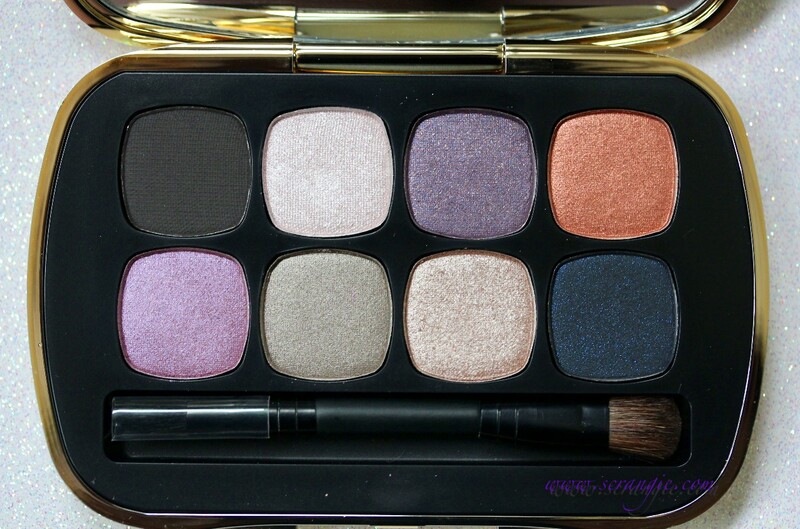 This palette is nice and useful for those who are maybe just starting out and experimenting with eye makeup. But for seasoned addicts (hehehe), it leaves a lot to be desired. Then again, it really takes a "Wow" product to impress a makeup junkie. ;) Hehe! I absolutely love your reviews! I love how honest and straightforward they are. Please, never stop reviewing makeup! I got both palettes by total fluke for great price on eBay..probably someone who works at Ulta or Seph. and has access to taking stuff in name of putting out new samples! I really had issue with how frosty some of the shades went on. I am older and it's true. When you get older or have a hooded eyelid you do need to watch out for some of the frosts. There are some that just really nail those issues of an aging eye and make it look smaller & like you are way too much eyeshadow...and that's what the new BE super shimmers have in them that others I try (Tarte, Nars, Laura Mercier, etc) don't have to them. The loose BE's did not do this to me even if they were glimmers or whatever the name is for the next level up they have in loose that has more shine in it. I am really glad I did not pay $40 for each. I invaded one of the pallets to try so will be trading it on MUA & selling the one I have not touched. Love the idea it's easier to find shades this way vs. sorting through a ton of loose pots - but with Shedio driving the boat now, not sure I am going to like a lot of the changes. Oh, I do like most all the shades. I think they are wearable. We cannot all do and have the big silver palette from UD. These are basics and then some color wise. Just wish they will tone down the frost - it's really way out there too much. Glad you thought so too and it's not just my ancient eyes! Thank you for this. 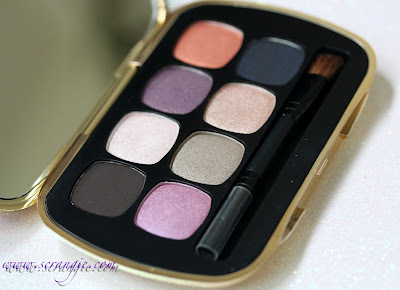 I have had my eye on this, since I love Bare Escentual loose powder shadows. Sad to hear it isn't alot of product for the price. I guess I'll pass it up for now. 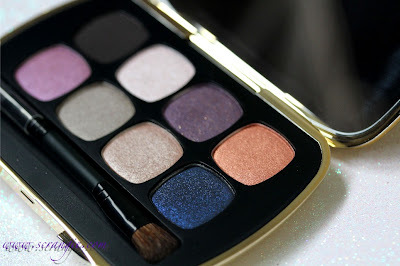 Lovely review but I was most excited about that blue, disappointed to see how it just looked like a blackened blue and not as jewel toned as I was hoping. I'm wondering if something like Fyrinnae's Pixie Epoxy might bring it to life? Thanks for the review of this palette - I was considering getting this, but now that I've seen how frosty the shades really are I think I'll save that money for something else. I'm with Mandy - I thought that blue was going to be more vibrant. One thing I noticed - while I agree that the colors don't seem to work with each other as a full set, they might work better in pairings? For example, I can see Black Tie Optional with Elixir, Icebreaker with Invite Only, and Swanky with Libation. They remind me of some of their existing duos (The Honeymoon Phase, The Scenic Route) even though they aren't exact dupes.